Air movers, or air horns, are used wherever there is a need to disperse fumes, move air into confined spaces, cool men working in elevated temperature conditions, or cool machinery or products with a blast of directed air. Common applications are found in refineries, chemical plants, utilities and cogeneration units, metal fabrication plants, paper and pulp plants, shipyards, the marine industry and the steel industry. Air movers have been tested at an independent laboratory. The listed free flow ratings are based on tests to AMCA standard 210. Under identical situations, the air movers exceeded all the air flow ratings of competitively manufactured air movers. Our new polymer horns offer reduced weight, longer life and they are crush and dent resistent. We are the only manufacturer to offer all sizes with a polymer horn. The polymer is electrically conductive to safely discharge any statuic buildup. Our air ducting (TX-SAC-N-GO) is available in three sizes, 8", 12" and 16" diameters and 30' in length. The ducting is made of single-ply PVC coated polyester fabric with a spring steel wire helix and external PVC wear strip. The ducting has its own storage bag attached to the cuff end. Simply attach the cuff end to the air movement device and pull the opposite end from the bag and place into position. When finished, the hose can easily be put back into the bag for storage and carrying. 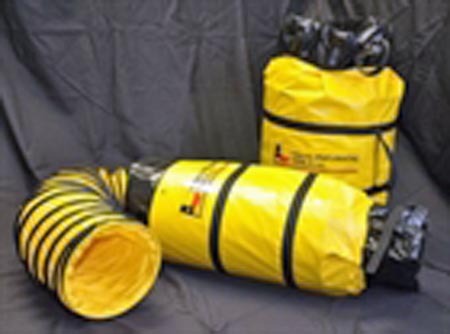 Our design allows multiple bags to be combined for long duct runs. No additional connectors are needed. The end of one hose can be inserted into the cuff end of another. All ducting can be placed on either end of an air mover or fan. The hose can be used for supply or suction. Electrically Conductive Ducting has carbon impregnated into the PVC coating and has a ground wire that runs the length of the duct. The ground wire will safely discharge any potential static buildup. The ducting was tested to UL 94 Standard and certified as fire retardant. The TX-SAC-N-GO-8 is designed to be used with the TX-3AM and TX-3AMS. The TX-SAC-N-GO-18 is designed to be used with the TX-8AM, TX-10AM or the new TX-JF16 Jet Fan. Texas Pneumatic air movers have been tested at an independant laboratory. The free flow ratings listed are based on tests to AMCA Standard 210. Under idential testing situations, Texas Pneumatic air movers equalled or exceeded the air flow of competitively manufactured air movers.